Patients report that they have been shocked or burned or have suffered spinal-cord nerve damage ranging from muscle weakness to paraplegia, FDA data shows. WEST COLUMBIA, South Carolina — Desperate for relief after years of agony, Jim Taft listened intently as his pain management doctor described a medical device that could change his life. Taft's stimulator failed soon after it was surgically implanted. After an operation to repair it, he said, the device shocked him so many times that he couldn't sleep and even fell down a flight of stairs. Today, the 45-year-old Taft is virtually paralyzed, barely able to get to the bathroom by himself. For years, medical device companies and doctors have touted spinal-cord stimulators as a panacea for millions of patients suffering from a wide range of pain disorders, making them one of the fastest-growing products in the $400 billion medical device industry. Companies and doctors push them as a safe antidote to the opioid crisis in the U.S. and as a treatment for an aging population in need of pain relief. But the stimulators — devices that use electrical currents to block pain signals before they reach the brain — are more dangerous than many patients know, an AP investigation found. They account for the third-highest number of medical device injury reports to the Food and Drug Administration, with more than 80,000 incidents flagged since 2008. Patients report they have been shocked or burned or have suffered spinal-cord nerve damage ranging from muscle weakness to paraplegia, FDA data shows. Among the 4,000 types of devices tracked by the FDA, only metal hip replacements and insulin pumps have logged more injury reports. Medical device manufacturers insist spinal-cord stimulators are safe — some 60,000 are implanted annually — and doctors who specialize in these surgeries say they have helped reduce pain for many patients. Most of these devices have been approved by the FDA with little clinical testing, however, and the agency's data shows that stimulators have a disproportionately higher number of injuries compared to hip implants, which are more plentiful. The AP reported on spinal stimulators as part of a nearly yearlong joint investigation of the global medical devices industry that included NBC News, the International Consortium of Investigative Journalists and more than 50 other media partners around the world. Reporters analyzed millions of medical records, recall notices and other safety warnings, in addition to interviewing doctors, patients, researchers and whistleblowers. In response to reporters' questions, the FDA said last week it was taking new action to create "a more robust medical device safety net for patients through better data." ″Unfortunately, the FDA cannot always know the full extent of the benefits and risks of a device before it reaches the market," the agency said. In the last 50 years, the medical device industry has revolutionized treatment for some of the deadliest scourges of modern medicine, introducing devices to treat or diagnose heart disease, cancer and diabetes. On top of that, lobbying records show the top four spinal-cord stimulator manufacturers have spent more than $22 million combined since 2017 to try to influence legislation benefiting their overall business, which includes other devices. In a case the previous year involving stimulators, Medtronic Inc. agreed to pay $2.8 million to settle Justice Department claims the company had harmed patients and defrauded federal health care programs by providing physicians "powerful" financial inducements that turned them into "salesmen" for costly procedures. Medtronic denied wrongdoing. "As a matter of policy, Medtronic does not comment on specific litigation," the company said in a statement. "We do stand behind the safety and efficacy of our Spinal Cord Stimulators and the strong benefits this technology provides to patients, many of whom have tried all other therapy options to no benefit." That process became the standard path to market for thousands of devices, including hip replacements implanted in tens of thousands of patients that would later be recalled because metal shavings from the devices made some people sick. The AP found that the FDA has allowed some spinal-cord stimulators to reach the market without new clinical studies, approving them largely based on results from studies of earlier stimulators. Spinal stimulators are complex devices that send electrical currents through wires placed along the spine, using a battery implanted under the skin. The four biggest makers of stimulators are Boston Scientific Corp., based in Massachusetts; Medtronic, with headquarters in Ireland and the U.S.; Nevro, in Redwood California; and Illinois-based Abbott, which entered the market after its $23.6 billion purchase of St Jude Medical Inc.
St. Jude's application to go to market with its first stimulator contained no original patient data and was based on clinical results from other studies, while Boston Scientific's application for its Precision stimulator was based largely on older data, though it did include a small, original study of 26 patients who were tracked for as little as two weeks. For example, there have been only six new spinal-cord stimulator devices approved since 1984, with 835 supplemental changes to those devices given the go-ahead through the middle of this year, the AP found. Medical device manufacturers have cited multiple industry-funded studies showing the effectiveness of spinal-cord stimulation in the treatment of chronic pain. FDA said in a statement that its decisions are "based on valid scientific evidence" that the devices are safe and effective. On lifetime worker's compensation after his right arm was crushed as he hauled materials for an architectural engineering company, Taft had been seeing the doctor for five years before he decided to get a stimulator in 2014. What finally swayed him, he said, was the doctor's plan to wean him off painkillers. "I felt backed into a corner," said Taft. Taft said his doctor praised the technology, saying stimulators had improved the quality of life for his patients. But four years later, Taft is unable to walk more than a few steps. Taft is one of 40 patients interviewed by the AP who said they had problems with spinal-cord stimulators. 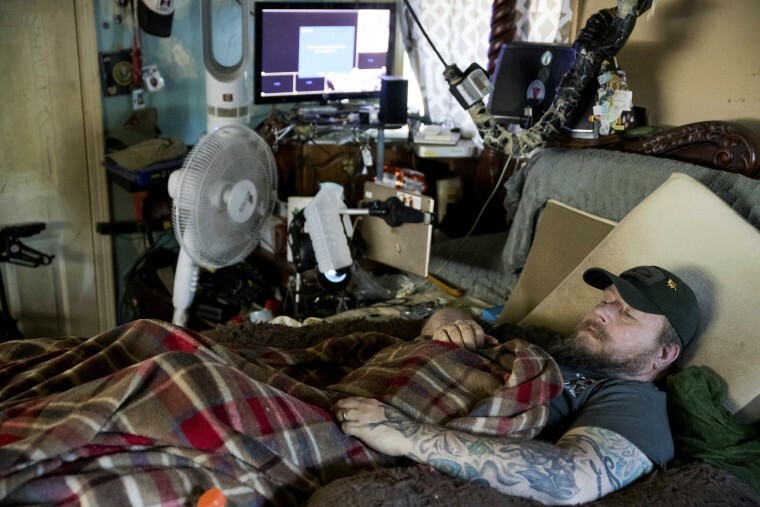 The AP found them through online forums for people with medical devices. Twenty-eight of them said their stimulators not only failed to alleviate pain but left them worse off than before surgery. Zuckerman, who worked at the Department of Health and Human Services and as a senior policy adviser to then-first lady Hillary Clinton, said no doctor wants to think they're harming patients. Physicians must show that conservative treatments failed to help. Patients also undergo psychological assessments to evaluate the likelihood of success. They then typically undergo a trial period lasting three days to a week with thin electrodes inserted under the skin. If patients say they got relief from the external transmitter sending electrical pulses to the contacts near their spines, they have surgery to implant a permanent stimulator. From the time Taft's device was placed inside his body, he had nothing but problems, according to hundreds of pages of medical records reviewed by the AP. The device began randomly shocking him, and the battery burned his skin. Taft and his wife complained repeatedly, but said his doctors and a Boston Scientific representative told them stimulators don't cause the kind of problems he had. That runs counter to Boston Scientific's own literature, which acknowledges that stimulators and the procedures to implant them carry risks, such as the leads moving, overstimulation, paralysis and infections. Taft's stimulator was surgically removed in August 2015. The following June, Taft got a second opinion from a clinic that specializes in spinal injuries, which said he had "significant axial and low back pain due to implantation and explantation" of the stimulator. The doctor said the overwhelming majority of his stimulator patients gain significant pain relief. Boston Scientific said it never received the stimulator that was implanted in Taft and so could not "conclusively identify" the cause of his problems. "Numerous factors can contribute to a patient's ongoing symptoms, from increased physical activity to the onset of pain in other areas," the company said. He referred AP to Pete Corby as one of his surgical patients who was helped by a spinal-cord stimulator. Corby, who injured his back working as a movie stuntman, got the device more than two years ago and says that after some initial adjustments he hasn't had any further problems. He says he wouldn't trade the stimulator for opioids. Falowski said opioids are good for acute pain, but were never meant to treat long-term chronic pain. For him, that's where stimulators come in. Experts interviewed by the AP said doctors are not legally required to tell patients about financial relationships with medical device manufacturers, but that it would be the right thing to do. This story is part of a global project organized by the International Consortium of Investigative Journalists to examine the medical device industry. More than 250 reporters in 36 countries, including reporters for NBC News and the AP, worked on stories that began publishing Sunday. Mitch Weiss is a Pulitzer Prize-winning reporter for the Associated Press. Holbrook Mohr is a reporter for the Associated Press.